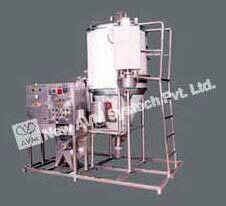 ‘AVM’ Pilot Spray Dryers are complete skid mounted packaged plants, comprising of Air heating section, Spray chamber, Cyclone separator, Bag filter liquid pumping system, liquid atomization system, air circulation blowers, Control Panel with Instruments. AVM offers Pilot / Mini Spray Dryers with variety of Configurations. 2 Stage Systems with Internal Fluidized Bed. Closed Loop Systems with inert gas as process drying media. Rotating air Brooms for sweeping chamber walls.